Escape from the city's bright glow. Dark Sky Finder helps you locate nearby dark skies to take a telescope, watch a meteor shower, or simply relax under the stars. 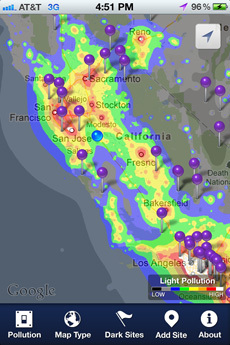 See light pollution maps of the entire world, along with dots to indicate good observing locations. 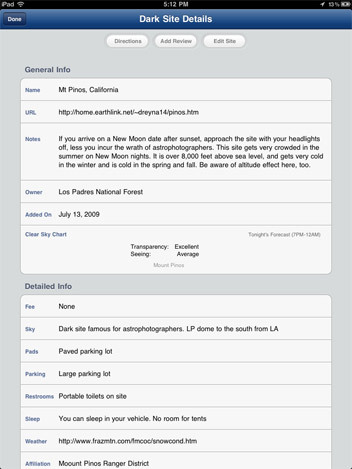 Each dark site includes reviews, directions, information, Clear Sky Charts, and more. Look up at night in the citysee that glow? That's light pollution. Light pollution maps of the entire world are overlaid on top of the standard, satellite, or hybrid map. 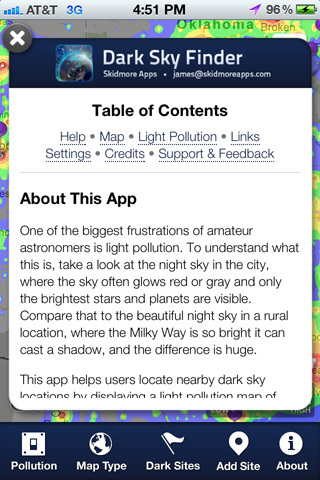 Dark Sky Finder includes the most recent light pollution data compiled by David Lorenz. Escape to dark skies in 1,000+ locations around the world. 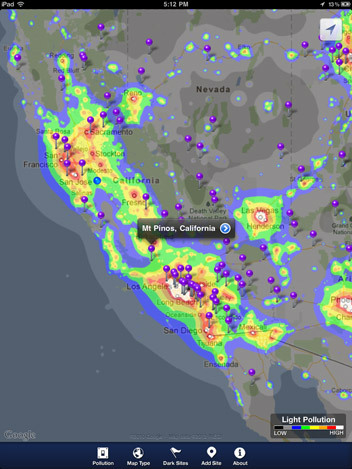 These dark sites are indicated by pindrops on the map in Dark Sky Finder. Each site includes user reviews, directions, and information on sky conditions, important notes, parking, fees, bathrooms, camping, weather, and much more. Users can make a contribution by adding or editing a dark site for everyone to enjoy. Once a user visits a site, they can also leave a review. Finds the nearest Clear Sky Chart* to pull in information on transparency, seeing, and other conditions relevant to telescope observers. 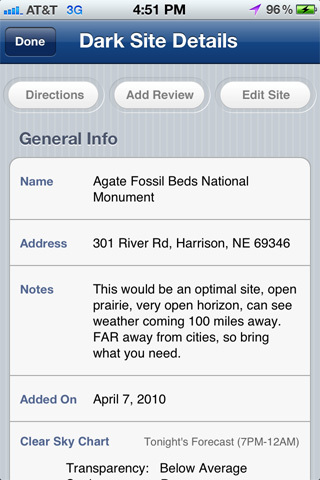 Tap on the map legend to toggle between the Bortle Scale and a more basic scale. Read more about the Bortle Scale for measuring light pollution in the About tab. For support or to give feedback, get in touch by clicking Contact above. You will receive a prompt response, usually in a few minutes to an hour. Feedback is always appreciated! * Dark Sky Finder is not affiliated with Clear Sky Charts. 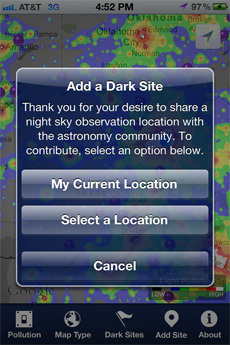 Dark Sky Finder is available as a Universal Appone purchase for iPhone, iPad, and iPod Touch. For questions, feedback, or press inquiries, please get in touch by emailing . Many thanks are due to Jonathan Tomshine for the resources and assistance he provided, including the large initial database of dark sky sites. Another huge thanks are owed to David Lorenz, who created and published the 2006 light pollution maps for the entire world. His website can be found here. Thank you to Attilla Danko for the wonderful resource he built for astronomers. Many of the features in this app are a result of the beta testers' hard work. This app would not be the same without the time they put into reviewing it and suggesting improvements. 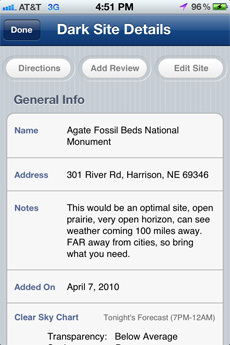 The dark sites listed in this app are added and maintained by the public community. 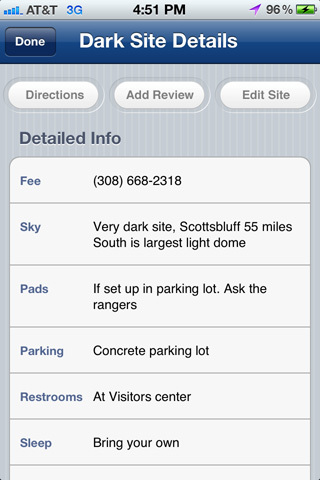 These sites are NOT reviewed in person or endorsed by Dark Sky Finder or Skidmore Apps (Skidmore Properties, LLC). Skidmore Apps does not verify the accuracy of any information listed with each dark site contained in the app. Skidmore Apps © 2014. All rights reserved.